“Sattler and Ryan’s new text is a gift to both emerging and experienced examiners. This edition preserves Dr. Sattler’s characteristic precision and merges this with incredibly supportive, comprehensive and practical advice for new examiners. 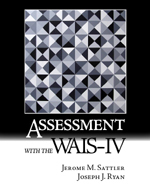 It simultaneously provides an excellent review of familiar testing procedures and detailed explanations for new subtests, prompts, and administration guidelines for the fourth edition of the WAIS. The authors feature the most current research, especially concerning the assessment of dementia, and present deeply sensitive thinking about assessment and diversity. They also offer a creative, extensive description of testing-of-limits procedures for more seasoned examiners, and critical discussions regarding strengths and limitations of the WAIS-IV. “This book is a great resource for those wanting to be more familiar with the development of, administration, scoring, and interpretations the WAIS-IV. This is a must have for graduate students that are learning the WAIS-IV and want to be able to integrate the measure into their own practice."